RTÉ have been using our ImageIndex+ software for some years to manage their stills library. More recently, they decided to exploit the resource commercially. We were approached to put together a system that would manage internal library procedures, allow free public access and provide an external e-commerce site. 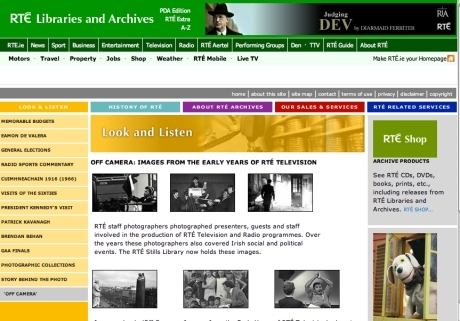 ImageIndex+ allows RTÉ access to the image collection via their intranet. It has brought efficiences in the management of images and orders through automated image loading, batch cataloguing facilities and support for orders and delivery. The RTÉ project was launched in November 2008.